Austrian Post (Oesterreichische Post) is an Austria-based provider of mail shipping services. Its main business activities include the transport and delivery of letters, direct mail items, print media and parcels. The company was established in 1999 after its split-off from the mail corporate division of the former telecommunications Austrian concern Post und Telekom Austria. The company operates through three main business divisions - The Mail, The Parcel and Logistics and The Branch Network Division. Austrian Post Office runs nearly 1,900 postal service points and employes over 23,000 people. 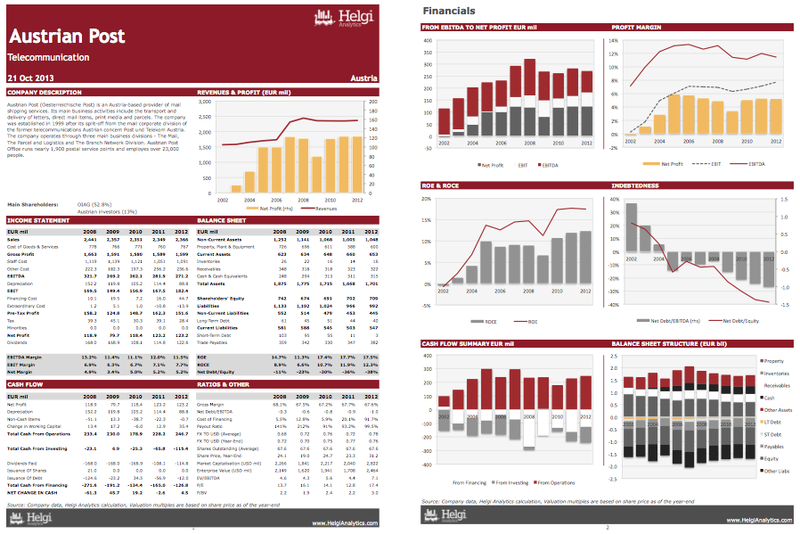 This report offers a summary of the company's performance in 2002-2012. You will find here all the key numbers from the company's balance sheet, income statement and cash flow on the annual basis. 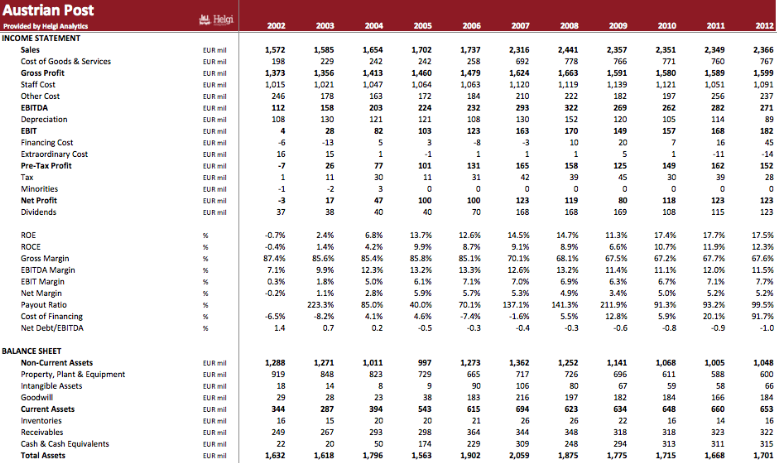 This excel file offers a summary of the company's performance in between 2002-2012 on the annual basis. You will find here all the key numbers from the company's balance sheet, income statement and cash flow and the main ratios related to the company's business. The report summarises developments in the postal sector pertaining to implementation of the regulatory framework, quality of postal service, economic and social issues, employment, and technological changes. 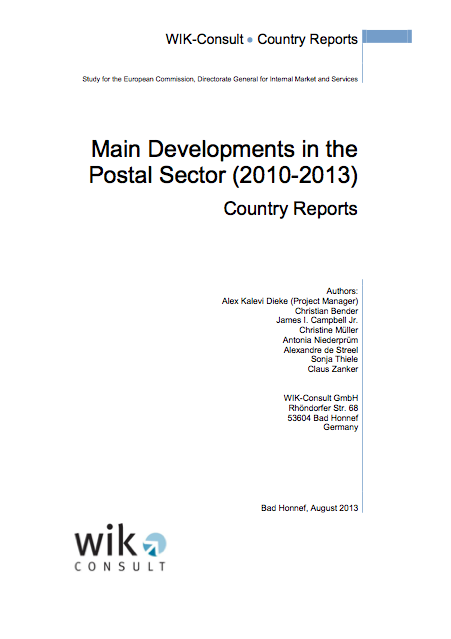 In addition, this study seeks to place recent developments in the larger context of European postal reform and the changing nature of the sector. Taking into account lessons learned from the past and foreseeable developments, we suggest options for policy makers to consider for further benefit of the postal sector in the future, including modernisation of the EU postal policy and its regulatory framework for postal services. This study covers the 28 Member States of the European Union; the 3 non-EU Member States of the European Economic Area (Lichtenstein, Iceland, Norway); and Switzerland. Austrian Post's net debt reached EUR -246 mil and accounted for -0.351 of equity at the end of 2014. The ratio is down 11.9% when compared to the previous year. Historically, the firm’s net debt to equity reached an all time high of 0.216 in 2002 and an all time low of -0.384 in 2012. When compared to EBITDA, net debt amounted to -0.738x at the end of the year. The ratio reached an all time high of 1.37 in 2002 and an all time low of -1.00 in 2012. As far as Austrian Post's peers are concerned, Ceska Posta posted net debt to equity of -1.26x and -11.9x when compared to EBITDA at the end of 2014. Deutsche Post DHL ended the year 2014 with a net debt at 0.199x of equity and 0.439x when compared to its EBITDA while Deutsche Post DHL had net debt at 0.199x of equity and 0.439x to EBITDA at the end of the year. You can see all the company’s data at Austrian Post Profile, or you can download a report on the company in the report section. Austrian Post's total assets reached EUR 1,671 mil at the end of 2014, up 8.14% when compared to the previous year. Current assets amounted to EUR 645 mil, or 38.6% of total assets while cash reached EUR 264 mil at the end of 2014. On the other hand, total debt reached EUR 17.7 mil at the year-end, or 38.6% of total assets while firm's equity amounted to EUR 703 mil. As a result, net debt reached EUR -246 mil at the end of 2014 and accounted for -35.1% of equity. Austrian Post made a net profit of EUR 147 mil under revenues of EUR 2,371 mil in 2014, up 18.9% and 0.156%, respectively, when compared to the last year. This translates into a net margin of 6.18%. Historically, the firm’s net profit reached an all time high of EUR 147 mil in 2014 and an all time low of EUR -2.55 mil in 2002. Since 2009, the firm's net profit has increased 83.8% or 12.9% a year on average. On the operating level, EBITDA reached EUR 334 mil, up 7.36% when compared to the previous year. Over the last five years, company's EBITDA has grown 4.40% a year on average. As far as Austrian Post's peers are concerned, Ceska Posta posted net and EBITDA margin of 1.10% and 5.83%, respectively in 2014, Deutsche Post DHL generated margins of 3.66% and 7.67% and PPL Czech Republic's profit margin reached 9.15% on the net and 16.5% on the EBITDA level in 2014. Austrian Post made a net profit of CZK EUR 147 mil under revenues of EUR 2,371 mil in 2014, up 18.9% and 0.156%, respectively, when compared to the last year. This translates into a net margin of 6.18%. Historically, the firm’s net margin reached an all time high of 6.18% in 2014 and an all time low of -0.162% in 2002. The average net margin in the last five years amounted to 5.37%. On the operating level, EBITDA margin reached 8.31% and EBIT amounted to 14.1% of sales in 2014.